Search engine optimization remains a core facet of any successful digital marketing campaign in 2018. But the tools, tactics and goals of SEO continue to evolve rapidly. To ensure your web content and overall strategy is still perfectly positioned, conduct an SEO checkup at least once per year. A thorough SEO checkup will illuminate your brand’s biggest strengths as well as its most obvious opportunities for improvement in this constantly changing landscape. 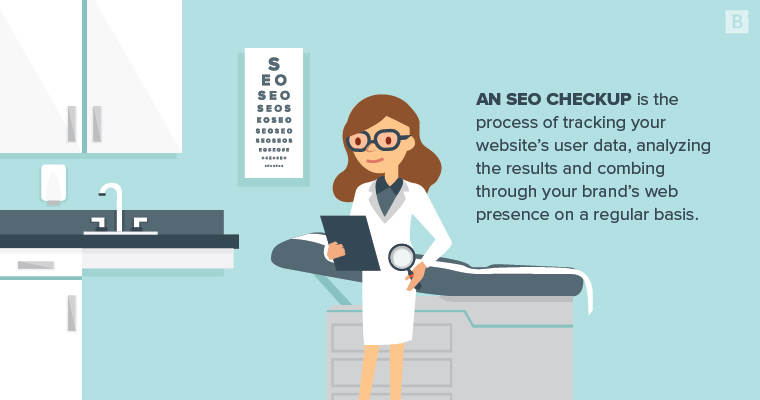 What is an SEO checkup? An SEO checkup describes the process of tracking your website’s user data, analyzing the results and combing through your brand’s web presence on a regular basis. At the end of this process, you should know exactly what’s working or what needs attention as you continue to refine your digital marketing strategy. The basic tenets of SEO will probably never change – marketers should always aim to create useful content that engages their audience and helps turn visitors into customers. It’s the details on how exactly to accomplish those goals that are constantly being tweaked with the help of an SEO checkup, even as industry trends change and algorithms are updated. Why is it important to conduct an SEO checkup regularly? Google makes minor changes to its search algorithms hundreds of times per year, with “major” updates that have a significant impact on search rankings rolling out every few months. While you might not need to conduct a full-fledged SEO checkup quite as often, this demonstrates how quickly a marketing strategy can go from cutting-edge to outdated. An SEO checkup addresses what’s working, what isn’t, and how the goalposts have shifted since the last time you conducted a website audit, or since the last major algorithm update. A comprehensive SEO audit will provide a concrete action plan for refining certain aspects of your website’s content and design. That brings your site in closer alignment with the latest SEO best practices, as well as the most recent version of your overall marketing strategy. The best SEO checkup for your website will look different depending on your brand’s marketing goals, your current web presence, your audience and much more. Still, there are several key points your review should touch on to make the biggest impact on ranking and authority. Keywords: As the building blocks of SEO, keyword strategy will always be a focal point of any digital marketing campaign. Make sure your web content is targeting the right keyword intent (locational, informational, commercial). At the same time, take note of any new keywords to target going forward. SEMRush and Moz both have great keyword research tools for this purpose. Backlinks: The primary way search engines measure the authority of a website is through backlinks, or how many other pages cite the same page as a source. You will want to periodically check that any backlinks your site has received are from reputable sources. Use tools such as Search Console and SEMRush for backlink-tracking functionality. Site design: Search engines are getting much better at analyzing user experience based on both on-page design as well as back-end efficiency. That means UX plays a bigger role in rankings as search engines reward well-crafted pages and penalize those that appear cluttered, slow or unsafe. Review where and how UX could improve across your website, including broken links that need fixing or any pages that should be reorganized. Use Google’s Mobile-Friendly Test tool to get started. User behavior: You’ll never really know if any part of your SEO strategy is working until you test it and analyze the results. Use Google Analytics to track more than just pageviews – examine where visitors are coming from, how they are interacting with different page elements or why they aren’t following through with a purchase under different circumstances. Check user Behavior Flow in Google Analytics to see where users are leaving your site, or where there might be a more streamlined path to get them to convert. The most comprehensive and effective SEO checkup is one performed by a trusted expert, ideally a third-party consultant who can give you an unbiased audit of your website and strategy. But for more regular, small-scale checkups, there are several tools available and tricks to take advantage of yourself. One of the first stops on your SEO checklist should be Google’s Search Console. Search Console offers a plethora of analytics tools, guides and support resources to get your site audit started on the right foot and refer back to as needed. Other SEO platforms like SEMrush and Screaming Frog include tools to help diagnose issues, hunt down bad links and much more. Utilize ever available resource and implement changes based on your checkup, or look to refine your overall strategy when the time is right. The value of an SEO checkup isn’t limited to the ways it helps improve search rankings and performance. It will also give you a concrete plan for how to create a better experience for users and foster closer engagement with customers. That’s what makes this process a crucial part of your overall business strategy, and truly a win-win-win for everyone. Andrew Morrell is a writer based in Chicago. He enjoys reading and writing about a wide variety of topics, from health to financial planning. Otherwise, he's into fun things too, like fostering kittens and exploring the city.